BCV5 - Db2 Cloning tools for Fast Database / Tablespace Copies, Clones, Refreshes. Flashcopy, Timefinder, DSN1COPY, DB2 Image Copy, data masking, unload load alternative, fast db2 load. BCV5™ provides for extraordinarily fast cloning, copying, and refresh of IBM® Db2® databases, tablespaces, and/or tables. BCV5 copies or migrates all kinds of DB2 objects: DATABASES, TABLES, INDICES, PAGESETS and optionally the corresponding objects like VIEWS TRIGGERS, FUNCTIONS, GRANTS, BINDS and RUNSTATS. Thus BCV5 copies both, data and structure, whereby all variations are possible: duplicate data and structure, duplicate structure only, copy only data, customise structure and copy changed objects, etc. Plus the BCV5 Db2 cloning tool has the capability to copy select partitions of partitioned tablespaces. .
BCV5 makes for fast, reliable copies, clones, and refreshes of DB2 data. Compared with other methods based on UNLOAD/RELOAD or DSN1COPY, BCV5 works up to ten times faster. That is, BCV5 requires on average only 10% of the resources (CPU, SSU/SRU) and wall clock time required by conventional copying methods. Although not required, the product can leverage hardware copy facilities like IBM® FlashCopy®, EMC TimeFinder®, etc, if you have them. A great alternative to Unload Load that allows refreshing medium and large data stores in record time. Previously time consuming copies / refreshes can now be done at any time... no more waiting for weekends or month-ends. Fresh data and test environments anytime. Time demands on the DBA for tedious tasks and efforts are reduced with intelligent automated that allows DBA's to focus on important tasks. Db2 data masking / data scrambling / anonymizing of sensitive data can now be done at fast "one - pass" speed. BCV4 for full Subsystem Clones. Adds capability for SAP and PeopleSoft users. Database clones in the same or different DB2 systems. Database Copy/Refresh/Clones in the same or different DB2 systems. Ability to Do Fast Copies from Simple to Segmented RRF. Fast, Unique Capability to Copy Select Partitions of Partitioned Tablespaces. To provide for minimal suspension, or no suspension at all, in the source database's availability, BCV5 accepts as input Tablespaces and DB2 Image Copies! Also, the BCV6 option can allow for no interruption 24x7 copy capability. BCV5 allows Image Copies and/or Tablespaces as input sources and it is much easier to use than DSN1COPY. specifies wether only tables should be transfered or auxilliary objects like VIEWs, specifies whether only tables should be transfered or auxilliary objects like VIEWs. BCV5 takes care of the rest, fast and efficiently. 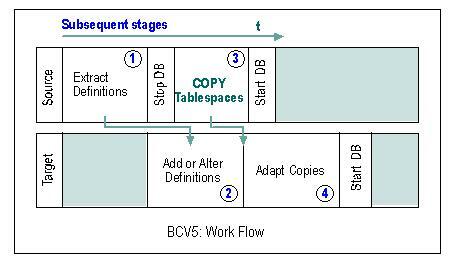 BCV5's process of cloning a DB2 Database or the copy / refresh of tables consists of four stages. Each stage executes automatically via a generated job. An ISPF environment simplifies initiation and tracking of cloning or copying requests. Stage 1 gathers all system information of the databases (or the tables) to be cloned from the source DB2 system, it generates a DDL stream for stage 2. Stage 2 uses this DDL stream and the renaming specification entered by the user to generate a job which will create the new objects in the target DB2 system. BCV5 allows renaming of the following attributes in its overall copy process: Database, Creator, Stogroup, VCAT. Stage 3, the copy stage, replaces the tablespaces created by stage 2 with copies of the original tablespaces from the source DB2. These copies can be DB2 Online Copies or any kind of Offline-Copies made by means of DSS, AMS or any other applicable tool including advanced copy services like Snapshot, Flashcopy, etc. Stage 4 adapts the tablespaces to the users renaming requests and DB2 requirements regarding RBA and OBIDs. 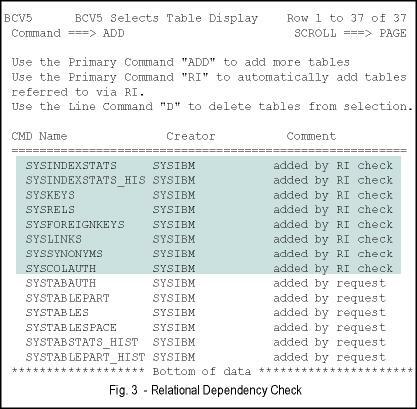 If, instead of entire Databases, only sets of tables are to be copied, BCV5's Relational Dependency Checker may be helpful. It determines all tables which are relationally dependent to already chosen tables and adds those tables to the set to be copied. The function is paramerterized - check levels, check direction: upwards, downwards. BCV5 fits into any given environment. The involved DB2 systems may reside on the same or different computers, LPARS, SYSPLEX, or JES networks. In a 24x7 environment even minimal suspensions may cause problems. Only DB2 Online CONCURRENT are then feasable. BCV5 can use these Online Copies - CONCURRENT or VIRTUAL CONCURRENT - as input. It automatically determines the most current copies from SYSIBM.SYSCOPY. BCV5 is fast. The differences in copy time between logical operations and BCV5 is dramatic, factor 10 up to 100 and more is usual. Logical copies which last hours will BCV5 complete in minutes. There are users who used to copy large systems over a whole weekend and now, with BCV5, they finish it in less than two hours. BCV5 not only shortens and simplifies table/database migrations and copies, it avoids as well most of the subsequent actions like establish GRANTs, Views, Binds, etc. Users reported about 'hours' of running Runstats before they introduced BCV5. BCV5 leads to a new level of performance. Similar signifcant as the difference in elapsed time is the difference in consumption of CPU resources. This means to BCV5 users that copies of large amounts of data need not anymore to be deferred to night shifts or weekends. BCV5's operating speed and its abilitiy to use DB2 Online Copies as input ensure highest availiability of production systems. The other, perhaps the most important attribute, of BCV5 is the combination of all necessary actions in one single, self-acting process. A user just selects the objects to be copied, BCV5 creates the new objects and fills it with data of the source objects. A copy process, a BCV5 Task, once defined may be repeated any time with one simple command. BCV5 takes today's high-speed hardware and copy/restore utilities, and accelerates them to new levels of performance. Its high-speed cloning process of DB2 databases is unique in the industry. Customers report improved levels of data integrity and availability due to the reduction of manual activities. Others report performance improvements, reduced manual effort, a stable production environment and the avoidance of lengthy undesired outages. BCV5 is compatible to pertinent DASD environment for z/OS® from all vendors. BCV5 utilizes standard interfaces only, thus it is compatible with all future versions of DB2. BCV5 provides fast generation of database clones in the same or different DB2 systems. It is the most appropriate tool for new business environments, test environments, training environments, development environments. No. 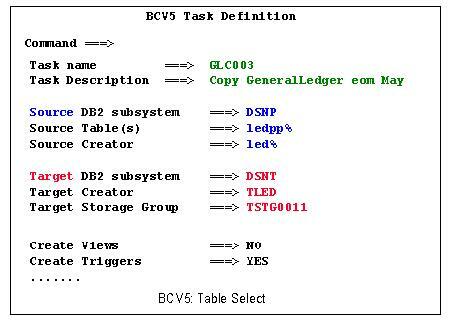 BCV5 copies DB2 Databases or Table Sets. BCV5 provides the capability to copy selected databases within the same DB2 system or into another DB2. BCV4 clones entire DB2 systems. If required, BCV5's stage 3 can deploy 'volume dump/restore', 'volume copy', or similar functions. How does BCV5 complement BCV4? BCV4 provides a clone of an entire DB2 system. BCV5 supplements BCV4 by allowing customers to "maintain" this environment. Customers find it convenient to have BCV4 create a completely new DB2 system, a clone, and afterwards use BCV5 to populate this system with additional databases, or to duplicate existing databases, or to "rewrite" existing databases i.e. refresh with production data. The other, perhaps the most important attribute, of BCV5 the combination of all necessary actions in one single, automatic process: the user just selects the objects to be copied, BCV5 creates the new objects and fills it with data of the source objects. A copy process, a BCV5 Task, once defined may be repeated any time with one simple command. BCV5 is compatible to pertinent DASD environment for z/OS from all vendors. BCV5 utilizes standard interfaces only, thus it is compatible with all future versions of DB2. BCV5 provides fast generation of database clones in the same or different DB2 systems. It is the most appropriate tool for new business environments, test environments, training environments, development environments. Try BCV5 for yourself with a Free Demo or 30 day Trial. Join us in an online Web Demo to view and discuss the product in a live session. If you like what hear and see, these products are available for a free trial period. Nothing proves the value of a product more than running it in house and seeing what it does for you. Copyright Enterprise Systems Associates, Inc.